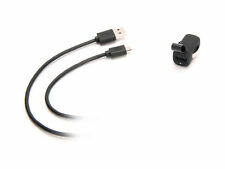 GRIFFIN DUAL PORT USB 12V (5V OUTPUT). A cigarette lighter socket for added convenience. Patented circuit board designed to protect your valuable gadgets from short circuits. Weight about 15 gram. 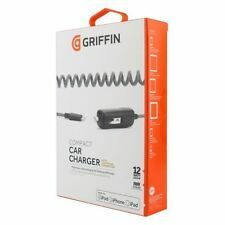 Genuine Griffin Compact Lightning In Car Charger iPhone iPod iPad. Condition is New. Dispatched with Royal Mail 1st Class Large Letter. 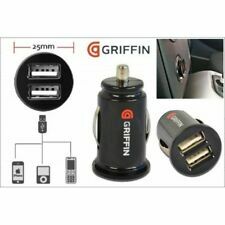 GRIFFIN DUAL PORT USB UNIVERSAL CAR CIGARETTE LIGHTER CHARGER / ADAPTER Mini Design, USB Mini Car Charger Adapter Use your car to charge any devices (digital cameras, PDAs, mobile phones, USB accessories and more) that can rely on USB for power! Compatible with most mobile phones / PDA/MP3/MP4/PMP/GPS Patented circuit board designed to protect your valuable gadgets from short circuits. A cigarette lighter socket for added convenience Ability to charge two devices at the same time Weight about 15 gram Color: Black Output Voltage /Current: each port 5V /1 A The listing is for the adapter only, cable is not included. No retail box / packaging included. Thank you. GRIFFIN DUAL PORT USB 12V (5V OUTPUT). A cigarette lighter socket for added convenience. Patented circuit board designed to protect your valuable gadgets from short circuits. The built in cable has an enhanced strain relief for longer life. Max-rate, safe 12W for Ipad,Iphone, Smartphone or tablets. Power provided to device: 12W, 5V@ 2.4A. No-tangle coiled cable stretches to 4.5 feet. It can be used with all lightning iPods, iPhone and iPad. for iPhone Lightning Devices. Can be used with all Apple lightning devices iPod, iPad and iPhone. Compact coil cable design resists tangling. 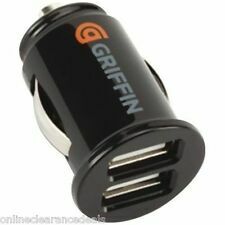 Griffin 4 port USB Car mains Charger for Mobiles Mp3 and Others 2.4 Amp. Condition is New. Dispatched with Royal Mail 1st Class. IWANTIT Dual USB Car Charger for Mobiles. Condition is New. Dispatched with Royal Mail 1st Class Large Letter. ORIGINAL / GENUINE GRIFFIN PRODUCT. Works in your vehicle's 12 volt power outlet. 5 watts per port (5 volts @ 1 amp). Super-compact form factor. 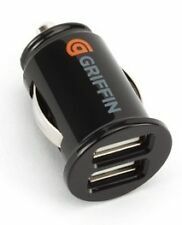 Griffin Compact Dual USB Car Charger for Mobiles Mp3 and Others 1 Amp. Condition is New. Dispatched with Royal Mail 1st Class.